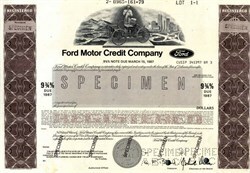 Beautifully engraved specimen certificate from the Ford Motor Credit Company printed in 1979. This historic document was printed by the American Banknote Company and has an ornate border around it with a vignette of an early Ford car, a mechanic and with a city in the background. This item has the printed signatures of the Company's officers. Ford Motor Credit Company LLC, popularly known as Ford Credit, is the financial services arm of Ford Motor Company, and is headquartered in Dearborn, Michigan. Its business activities are concentrated primarily in the area of automobile loans in support of its parent company. The company offers consumer loans and leases to car buyers, as well as business loans and lines of credit to dealerships selling Ford Motor Company products. The firm also issues commercial paper and other debt instruments on Ford's behalf. Ford Credit also owns Lincoln Automotive Financial Services, the arm that finances Lincoln vehicles.